The military rank of Marshal of the Soviet Union was established by a decree of the Soviet Cabinet, the Council of People's Commissars (Sovnarkom), on September 22, 1935 as the highest military rank of the Soviet Union with the exception of Generalissimus, a rank only given to Joseph Stalin. Nikolaj Aleksandrovitj Bulganin (born March 30th, 1895, Omsk Oblast) held the rank of Marshal of the Soviet Union from 1947 to 1958. During World War II, Bulganin played a leading role in the government and Red Army, although he was never a front-line commander. He was given the rank of Colonel-General and was a member of the State Defense Committee. He was appointed Deputy Commissar for Defence in 1944 and served as Stalin's principal agent in the High Command of the Red Army. In 1947, he became Minister for the Armed Forces and was promoted to the rank of Marshal of the Soviet Union. He also became a candidate member of the Politburo of the Communist Party, served as Minister of Defense 1953-1955 and Premier of the Soviet Union 1955-1958. In March 1958, at a session of the Supreme Soviet, Khrushchev forced his resignation. Bulganin was appointed Chairman of the Soviet State Bank, a position he had held two decades before, but in September 1958 Bulganin was removed from the Central Committee and deprived of the title of Marshal. He was finally dispatched to Stavropol as Chairman of the Regional Economic Council, a token position, and in February 1960 he was retired on a pension. Bulganin died on February 24th 1975 at the age of 79. 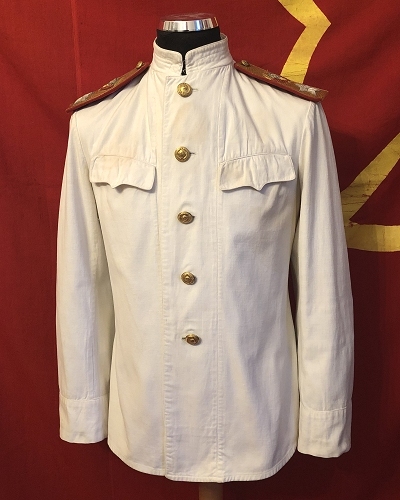 The summer uniform of Nikolai Bulganin was purchased from a large collection of exclusive Soviet wartime uniforms and is in excellent condition with some discoloration spots to the white garment. We have, following our policy, decided not to try to launder the tunic as these spots may as well be part of history. Bulganin was made marshal of the Soviet Union in 1946, hence the shoulder boards on the tunic are M/43 type but with the postwar 1946-1956 State coat of arms including 16 republics. The uniform set consists of the white cotton jacket and dark blue, red piped trousers. The tunic is a white summer M/43 type with golden boards and marshal/general type buttons with the 1946-1956 16 republic buttons. The tunic holds no further decorations or awards. Sold as a collectible or eveb a museum piece and not a wearable, the size of the set is - for reference - about 50-52 (US40). An impressive uniform that will display impressively in a Soviet wartime and early cold war collection. The uniform was initially in the Central Red Army Museum and was then sold off in the early 1990s. It has since been in the hands of a few high-end collectors in Russia and Europe. These white uniforms from the 40s - especially at this highest, named level, are very scarce and this is a great chance to obtain a very rare and precious set. The uniform comes with a document of authenticity issued by D.A. Drabik Soviet Militaria. Due to the value of this set, shipping with insurance is adviced.